Easily Confused or Misused Words: Learning English as a second language is not very hard. in this post we will learn that there are a lot of words in English language that look or sound alike but have very different meaning. Some words sound so similar, it's easy to confuse or misuse them when writing. Computer spell check won't catch these mistakes! along is moving or extending horizontally on. and a long referring to something of great length. Aloud is shout out loud, for example "He screamed aloud" while allowed means "permitted", "You are allowed to play this game". Although alright is widely used, it is considered nonstandard English. As the American Heritage Dictionary notes, it's not “all right to use alright.” this is most commonly misused English words by native speaker. bare means "naked; to uncover" Please bare the gift box". while bear stands for "to carry; to put up with" Please bear the new gift box with you". Principal is a noun meaning the head of a school or an organization or a sum of money. Principle is a noun meaning a basic truth or law. The principal taught us many important life principles. To recognize the spelling of Principal first think of yourself as a greedy opportunist. You definitely would want to be a pal of anyone who is in a position of power or anything to do with money. This principal has pal in it. Who's is the contraction of who is. Whose is the possessive form of who. “Who's going to figure out whose job it is to clean the stables?” this is another most commonly misused English words by native speaker. Actually if you are not native English speaker you will be very confused while some English people used to those words to you. Their pronunciation is very different from anyone else. Climactic is derived from climax, the point of greatest intensity in a series or progression of events. Climatic is derived from climate; it refers to meteorological conditions. The climactic period in the dinosaurs' reign was reached just before severe climatic conditions brought on the ice age. If you want to learn English as a Second Language you should not be worried, there are many online coaching center to learn English as a second language, you may start from BBC learning or EFL coach. Just google for those words and you will get hundreds of results. Emigrate means to leave one country or region to settle in another. In 1900, my grandfather emigrated from Russia. Immigrate means to enter another country and reside there. Many Mexicans immigrate to the U.S. to find work. Emigrate begins with the letter E, as does Exit. When you emigrate, you exit a country. Than is a conjunction used in comparisons; then is an adverb denoting time. That pizza is more than I can eat. Tom laughed, and then we recognized him. Than is used to compare; both words have the letter a in them. Then tells when; both are spelled the same, except for the first letter. Capital refers to a city, capitol to a building where lawmakers meet. Capital also refers to wealth or resources. The capitol has undergone extensive renovations. The residents of the state capital protested the development plans. Set is a transitive verb meaning to put or to place. Its principal parts are set, set, set. Sit is an intransitive verb meaning to be seated. Its principal parts are sit, sat, sat. She set the dough in a warm corner of the kitchen. The cat sat in the warmest part of the room. Foreword is a noun that means an introductory note or preface: “In my foreword I explained my reasons for writing the book.” Forward is an adjective or adverb that means toward the front: “I sat in the forward section of the bus.” “Please step forward when your name is called.” Forward is also a verb that means to send on: “Forward the letter to the customer's new address.” Easy but difficult most commonly misused words in English. EFL is an abbreviation for "English as a Foreign Language". This is mainly used to talk about students (whose first language is not English) learning English while living in their own country. ( For example, a Chinese person learning English in China.) ESL is an abbreviation for "English as a Second Language". 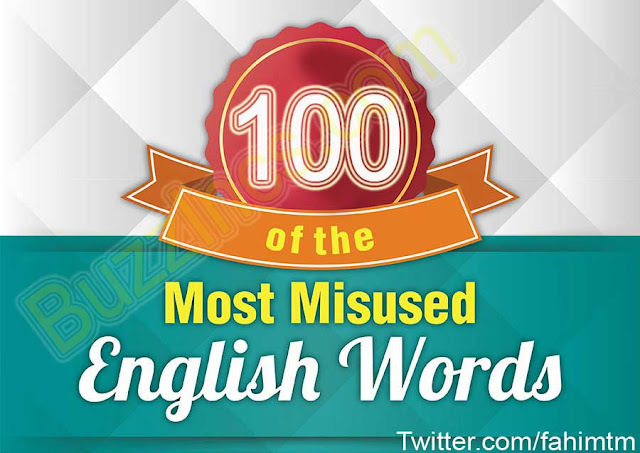 Those are the most commonly misused words and phrases in English language even native English speaking country people misused them. Its difficult for anyone to remember all those because only this list is not the end, there are thousands of words like this. So come with ideas and put all words in a place to practice them if you want to become fluent in English language. English as a second or foreign language is the use of English by speakers with different native languages, Such as Indian people or Bangladeshi people. As English is international language and it needs everywhere in the world you go you must learn English as a second or foreign language, doesn't matter what age is yours.